Press the lantern on the left and right of the wall to turn on. Watch the shadow of the rhino and cow head. 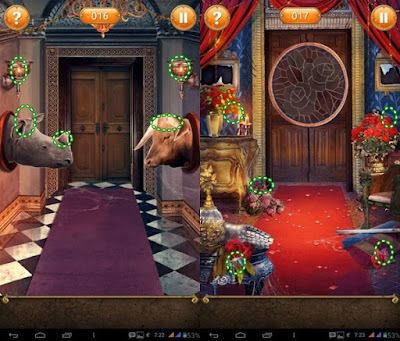 Press the ear and horn from the rhinoceros and press the cow's ears so the door opens. 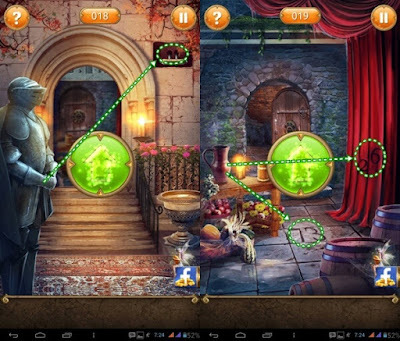 Move the puzzle pieces hidden around the room to the door. Notice the hand of the statue pointing towards the wall. Use a knife in the statue to dismantle the right wall and press the lever to open the door. Pull a pitcher onto the floor and the curtain so that it will see the numbers 73 and 26. Press the circle numbered on the door and press the number 7326. Press each box on the wall in the correct order then use the key on the table to open the door.